12 nights / 13 days of a classic beach holiday with the tropical tranquillity of coastal resorts, sunny beaches, and amazing seafood – as it is the ideal recipe for unforgettable Sri Lanka beach holidays. Visit Kalpitiya and enjoy a day in the sun with water sports and dolphin watching, unwind further in the ocean surrounding Trincomalee with snorkelling;, stopover in Passikuda for an adventurous water ski ride, surf your way to the top in Arugam Bay and look forward to relaxing in the sunny beaches of Hikkaduwa and Negombo. 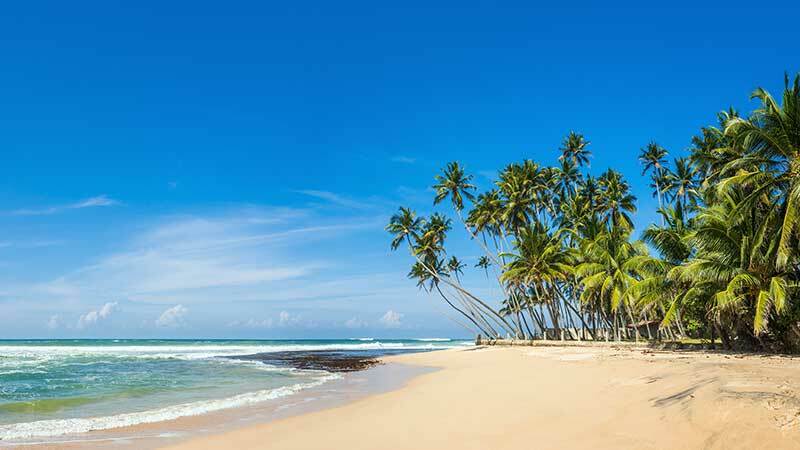 We have collected a selection of our favourite combinations of Sri Lankan beach destinations to suit all travellers seeking for some fun in the sun! On arrival at the Bandaranaike International Airport, you will get your first taste of warm Sri Lankan hospitality; Representative from Nkar Travel House will welcome you and transfer to Kalpitiya. Check-in to the hotel and relax to refresh for a memorable beach holiday in Sri Lanka. Overnight stay at hotel in Kalpitiya. Breakfast at the hotel and day spent at leisure or activities around Kalpitiya. Overnight stay at a hotel in Kalpitiya. Breakfast at the hotel and transfer to Trincomalee. Overnight stay at a hotel in Trincomalee. Breakfast at the hotel and sightseeing tour in Trincomalee. In the afternoon enjoy a boat ride to Pigeon Island. (OPTIONAL) Pigeon Island is a great place for diving, snorkelling and sea bathing. Breakfast at the hotel and transfer to Passikuda. Overnight stay at a hotel in Passikuda. Breakfast at the hotel and day spent at leisure or activities in Passikuda. Breakfast at the hotel and transfer to Arugam Bay. Breakfast at the hotel and day spent at leisure or activities in Arugam Bay. Breakfast at the hotel and transfer to visit Yala National Park. Morning visit Yala National Park for a safari. Situated in the southern province, Yala (Ruhuna) National Park showcases a vast variety of indigenous animals and is best known for large herds of roaming elephants and the ever-elusive leopard. The park’s dry thorn scrub, interspersed with small dusty glades, IT is reminiscent of Africa, a perfect environment for safaris. Breakfast at the hotel and day spent at leisure or activities in Hikkaduwa. Colombo, like many commercial capitals in developing countries is rapidly changing. Almost overnight, skyscrapers arise from where old buildings once stood. Yet in some parts, the old world charm is retained. For example, there is a 100-year-old clock tower and several British built colonial buildings. Other places of interest are the Pettah Bazaar – where one can shop for bargains, a Hindu and a Buddhist temple, residential areas where you find stately homes, the Bandaranaike Memorial International Conference Hall (BMICH) – an outright gift to Sri Lanka from the People’s Republic of China. Breakfast at the hotel and day spent at leisure or activities in Negombo.